Welcome to 2012! I am excited to share with you something I’ve been thinking about for months! I have had so many ideas and options floating around in my head. You name it, I’ve thought of it and it has really been difficult to pin down what exactly I wanted to provide for you all. I decided to go along with my “313” numbers since it’s served me well so far. January has 31 days and I kept coming back to 3 main points of focus for this challenge. I’m calling it 31.3 Jump. Want to know the 3 commitments? Glad you asked! I’m sure you’ve heard of this before. It’s a term used often yet is defined differently from person to person! Eating clean eliminates foods that are highly processed, complex and comprised of many ingredients. Think FRESH, SIMPLE and NUTRIENT-RICH. Sounds simple, right? This will look totally different for each of you. Some of you do nothing. Some of you are hit or miss each week. Others are pretty consistent. I want you to move more these 31 days and move more, consistently. There’s no doubt in my mind that our physical lives are connected with our spiritual lives. Many of you who have been struggling with weight loss, self esteem, or depression are missing an important connection—the body and spirit. Our bodies will die. In the long scheme of things, these 31 days are just a blink in light of eternity. Our spiritual lives are going on forever and we can’t forget about this. I believe you’ll find better results and more fulfillment if you keep this in line. Renewing ourselves both mentally and physically is essential to success! ♦ Your commitment! You can keep it quiet. You can tell your hubby. You can tell me. You can tell us. Just commit! ♦ Your friends! Yes you have accountability if you use any of the tools above, but it will be VERY easy to get lost in the sea of people. You will have higher success if you have a small group of 1 or 2 other friends who will do this with you. I know you’ve got someone out there! Ask them! ♦ Weekly Support: I’ll answer questions. Offer advice. Give you fresh ideas. Provide motivation. 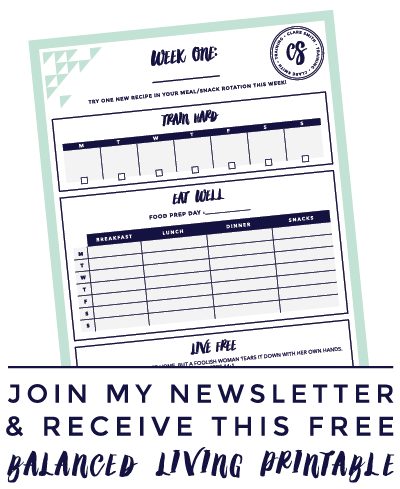 ♦ FREE Online Accountability: I’ll provide a spot for you to come and “check-in” daily and weekly! ♦ Memory Verse: I’ll create something (cute) for you to print off each week to post on the fridge or keep in your purse! ♦ My Prayers: I love my readers and I am passionate about helping you. I will be praying for you through this process! I came across this on the internet and realized this was EXACTLY what I was looking for. I’ve done everything in the “What I Want From You,” but I’ve never done it with all of my faith in Christ, His guidance and motivation. I’ve shared this with my husband and he was excited that I found it. We are expecting our first child in May, so this is just more encouragement for me to follow through! Thank you. Thank you. Thank you. Count me in. Thank you! I read about this on Facebook, and was really glad I decided to check it out. This is something I feel I really need right now. Many thanks! I NEED this!! I exercised for a whopping 20 minutes last night! My first workout of the year!!! I’ve declared January – a month of salads! I am going to eat a salad every single day – I went through the McD’s drive through yesterday and bought 2 lol! One for yesterday and one for today!!! And I’m headed to the grocery store today to buy more!!! 😉 Although there’s still a boatload of junk around the house – I can’t wait for it to all be eaten up and to eat clean!!! YEAH!!! LOVE that Women Living Well will pick this up too!!! I am so glad I found your blog. I am so excited to submit this issue to the Lord. Your guidance will be such a blessing! This is great, Clare! I am going on a cruise and will be gone January 20-28, but I plan on trying my BEST to eat clean/healthy AND workout while I’m away. There is no reason why this cannot be done. They have an amazing gym on ship and I know there will be fresh fruits and vegetables galore and I’m sure healthy protein to choose from! This is just the accountability I need! Is there a button for this challenge that we can post on our own blogs? Love it!! Just printed Week 1 and making a notebook “Eating Clean & Moving” for inspiration, recipes, and exercise ideas. I LOVE the Soul Food component!! I’m ready to get started!! Definitely doing this! I’ve started reading “Reshaping It All” as well in hopes of having changing my views on food and exercise. I don’t need to lose weight, but do want consistent exercise to be a regular part of my life (I do well for a short time, then slack off, then start back again) and to eat clean! This sounds like the challenge I need to help me with my health goals this year. Thank you! I’m in! Sounds great. 3 of my resolutions anyway! Finally something to get me EXCITED to start exercising and eating healthy, natural foods! Thank you! I’m looking forward to this challenge! I’d love to join this! Thanks! I’m in. I’ve started back working out and cleaning up my diet late November and have been looking for something like this! I’m so excited! This sounds awesome! How amazing is God!!! I started a 30 day fast of clean eating because I want God more than those foods that have consumed me – I started Dec. 28 I am sooo excited for this encouragement and resource He has provided!!! Thank YOU!!! Thank you so much for doing this. I can’t wait to do this. I want to join this. I signed up for the the message board, but what else do I need to do, please help. I’m in!!! After being a wife and mother of 4 under 4 I don’t have (make) time for myself in the area of fitness! Clare, that’s just the right thing at the right time! I am in!!! Oh, ME! ME! ME!!! Count ME in!!! My daughter and I have made a commitment to help each other this year (this is a big thing since she REALLY wants to make a change in her lifestyle – one that I hope will be a permanent one for her health) and this is just what we need to get started and keep the motivation going. We’re already “doing the gym” every day, but this has the depth I’ve been looking for to make the change inside and out! I’m in! Thanks for the motivation and the resources! Count me in, I’m ready to recommit myself to taking care of not only me , but my family as well. Just want I need…3 things to focus on should be simple enough…I hope. Making changes are tough…hope this can kick start my year. Thanks for the encouragement! I’m in. I’m in I’m in I’m in. EXACTLY what I need this morning! Right before Thanksgiving I “re-joined” (oh yes, been there before) Weight Watchers needing to lose 20-25 lbs. Most people discouraged me telling me to wait until January b/c the holidays were a terrible time to lose weight. I decided there was no time like the present and did not listen to my discouragers. I lost almost 5 lbs. Well, I make it through Thanksgiving and Christmas, to the week of New Years and I have gained back 3 lbs. Today is my meeting/weigh day and I’ve found myself almost in tears. Then I found this through Courtney at Women Living Well, and again, it’s EXACTLY what I need to get past the discouragement of failure and moving in hope toward my goal. Thanks so much! Count me in!!!! Not very computer savvy, but am willing to try. I’m so in! I love this idea and really do need to recommit myself to being healthier both physically and spiritually. This is great for me – exactly what I need for this season of life! Hi I found you through Courtney from Women Living Well. I need help too. I lost 62 pounds and I have already gained 20 back. I need help getting focused before it all comes back. I am in, I need something like this. Thank you!! I just found this and I want to give it a try..Count me in!! Would love to join you in this! Looking forward to losing and learning! Joining in!! Thank you so much for the opportunity. Sounds great! I’ve already started to exercise, but I’ll pretty clueless when it comes to the whole “clean eating”. Looking forward to the information, support and encouragement. Just what I need!! Count me in!!! Already trying to eat clean. Count me in! I’ve been a sweetaholic my entire life. I would start my meals with dessert first to make sure I always had enough room. I turn 36 this year and decided the last quarter of 2011 that I’d begin eating healthier. I switched to in season fruit instead of candy back in August and oddly enough, if you give me the option of sweet fruit, cake or candy, it’s going to be the fruit every time. It’s true what they say about it taking 21 days to form a new habit. My sweet tooth is gone (at least for the most part). I’ve only had a couple pieces of candy since August and that’s only because they were given to me. But I would have preferred an apple with peanut butter had that been offered :). I really need to continue with something lasting, permanent, realistic, and can work with mt life. I have started eating better started an organic diet last year but I really need to get into a commited workout routine. I had me when I heard you say how this connected to our spiritual lives. Never made that connection before, not like that. I can attest that if you want to succeed the best it has to start with God. I really need to continue with something lasting, permanent, realistic, and can work with my life. I have started eating better started an organic diet last year but I really need to get into a commited workout routine. You had me when I heard you say how this connected to our spiritual lives. Never made that connection before, not like that. I can attest that if you want to succeed the best it has to start with God. I know I am starting late, but like others I began these tips last year and have been working on improving in them. I love this challange and am committed to it. Thank you! I so want to do this and need to do this. I’m making my commitment! I love this idea! Are you going to do something like this for summer?